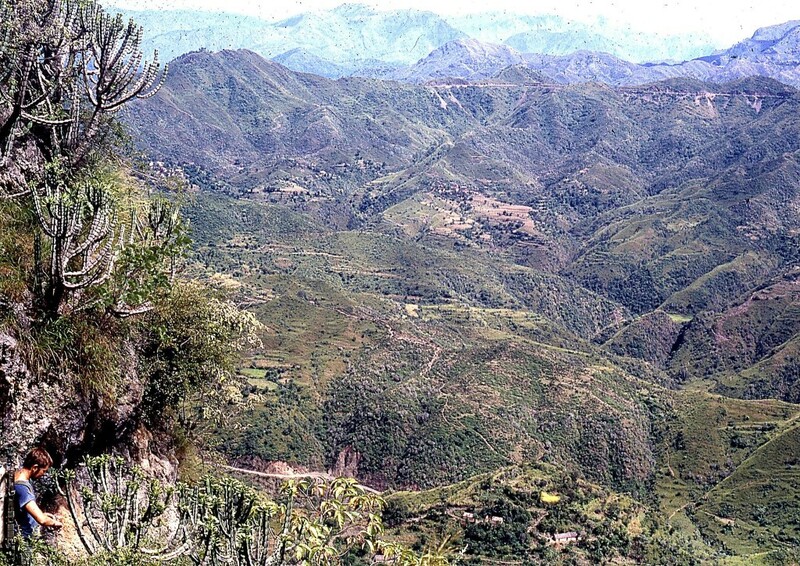 Trevor, Hodge and I along with the liaison officer visited a known cave called Dunga Dora. At first we had great difficulty finding the cave entrance until we met two locals who showed us the way. The cave is situated about two miles from the camp. Following the new road southward until it meets with the old road on the crest of a hill, there is a small house on the left. From behind the house there is a track running off more or less at right-angles to the road. The cave is about ten minutes’ walk from here and very hard to find as the track breaks down into several other tracks leading off in different directions. The quickest way from the camp is to take the old road which takes a more direct route. The cave was a bit of a disappointment in so much that we had been led to believe that it was a large one where upon entering it we found it was only about 100ft long. The cave entrance is a small crawl about three foot wide and two foot high. After about six or seven feet one can stand up in what appears to be a large rift. Both sides of the rift are covered with calcite and one or two calcite bosses. The cave extends a further 100 feet or more in a rift and one can traverse at different levels in the rift. Also present in the cave, besides us, were two large bats, small snails and several spiders. The cave at one time was visited by the local people who entered and worshiped one of their gods. The walls in places are covered with names and scribblings. 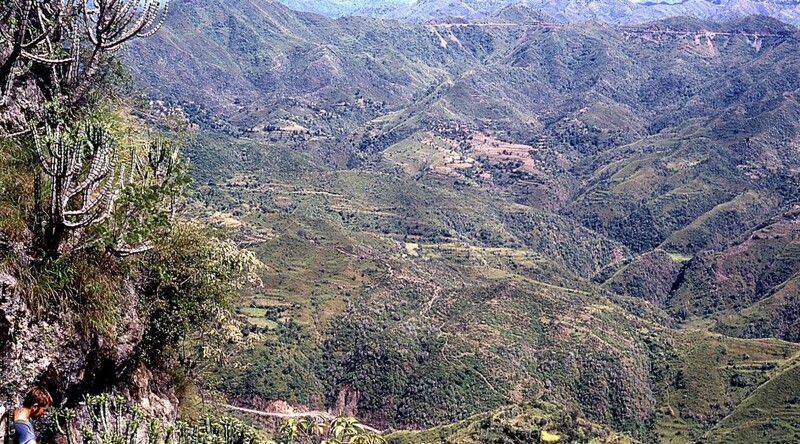 We returned to the camp a little disappointed but there was still a lot to be done in the surrounding hills. 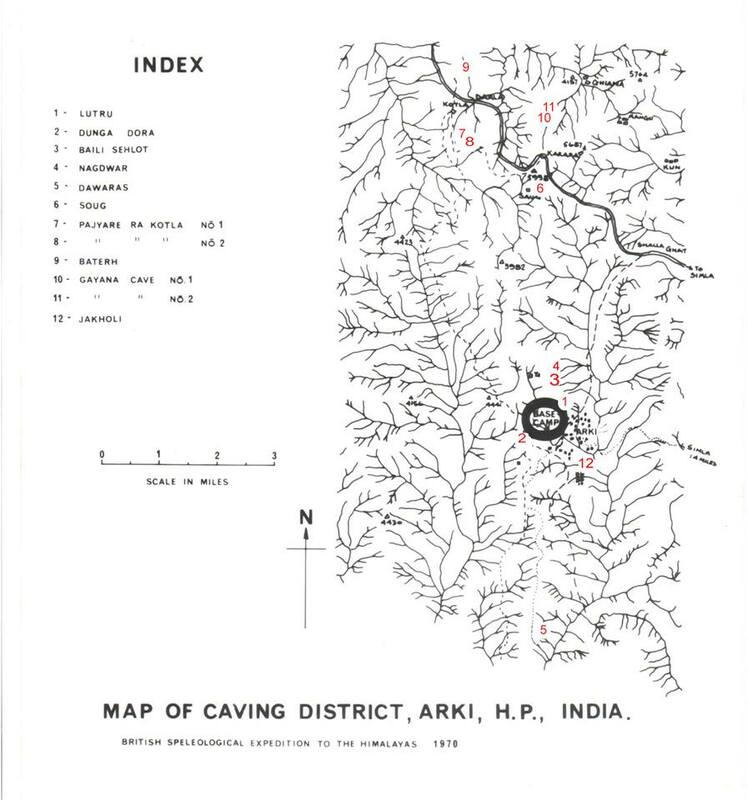 Jim and Ian on their return from Simla said that they had seen several cave entrances only a few miles out of the village when they were passing in the bus. These we decided to look at tomorrow along with a resurgence near the base camp. On our return from the cave it started to rain and unfortunately carried on for most of the night, though it saved us from having to play football. The weather was sunny in the morning, becoming overcast at mid-day and eventually raining in the evening. 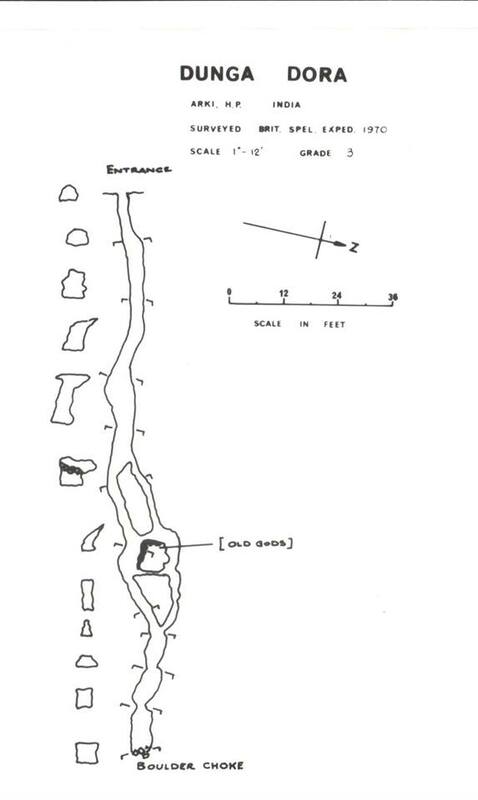 Below a cave location map, a cave survey and a general view of the area. Note, from now on some days will have plenty of pics others none, so I’ve had to add what I think is appropriate but may not have been taken on that day. Also from now on we broke up into small groups to search the area always leaving a couple back at the camp site. To the non cavers all this may seem a little boring but that’s expedition life.